We were recently honored at the ASID Interior Design Awards Gala for our Custom Design! The competition was open to all designer members of the Pennsylvania East Chapter of ASID. The Custom Design Award is presented to the interior designer who creates a “uniquely made furnishing or feature that is not mass produced, or a COM modification of a mass produced item.” Our custom piece is a French modern built-in bar. We are grateful to the craftsmen at Sherman and Gosweiler who produced the piece. The bar features a concealed refrigerator, trash, ice maker, and locked storage.With such effective use of the space, this fully appointed bar at counter height draws guests into this fireside living room lounge. 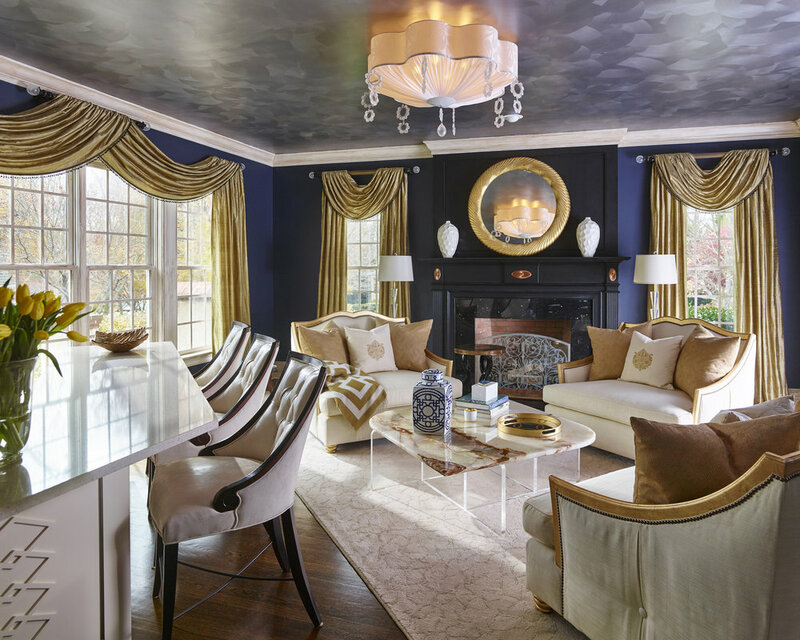 View Michelle Wenitsky Interior Design’s Houzz profile here. “Statement headboards. Tall headboards, particularly tufted upholstered ones, were highly searched on Houzz this year. They establish the bed as the focal point and increase its presence. They also lend themselves to pleasing symmetry in the bedroom. Click to read more at Houzz.